Hidracolors velvet and Hidracolors The quality and experiece of Salerm Cosmetics applied to long-lasting lipsticks: Hidracolor velvet and Hidracolors. 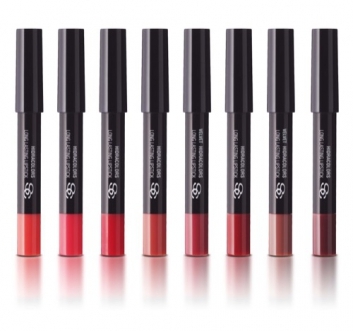 This unique lipstick fills lips with color in one simple stroke and there are 8 different available colors, six high-shine Hidrocolors and two matte Hidrocolor velvet colors. Its high-tech ingredients and technology provide a delicately soft and comfortable texture that maintains the lip’s natural moisture. Its application is so light that you don’t even feel like you’re wearing lipstick and there’s no caking or cracking. It’s easier to apply thanks to its pencil style twist format that needs no sharpening. Its practical conical tip gives you greater precision and the functions of a lipliner. Salerm Cosmetics new long-lasting lipstick is the new ‘must have’ beauty item.